As a boy, I used to sell poppies door to door for Uncle Eph (Eaphraim) Cooper. Well I guess it was for the Legion, of which he was a member, but I always called it for him. As such I learned what they were all about, and gained a great deal of pride in my Newfoundland and family heritage, learning about such things as the Battle of Beaumont Hamel, Vimy Ridge etc. Uncle Eph was a veteran of WWI, and I will always remember what he and his companions did and scarified for us, and I will always wear the poppy. I have no objection to those who want to protest war, my wearing of the poppy doesn’t signify a glorification of war. I do believe sometimes wars are necessary, or have been. Sometimes freedom IS at stake. And for those who are free to protest war, think about what your freedom cost. Do I believe some of the actions or government takes now are for freedom? No, I do believe many are for profit. And to me that’s just another sign of the deterioration of our so called democracy, not a reflection on our soldiers. Remember those who are lost, those who didn’t come home, those who sacrificed all. Remember that we are free, free to argue, free to not wear a badge, a number, free from incarceration without cause. Two things to say that others have said better than me. Don’t take our freedom for granted. Honor those who have fallen, but remember what they fought for, and lets make sure we don’t lose it from the inside. One of the most poignant remembrance day images comes from the comedy show Black Adder. Have a watch. Probably the toughest TV scene I’ve ever watched, if you can make it through without tears, well you’re doing better than me. Bonfire Night Time to see the Butche…er I mean Barber! At the end of the video, when the screen went silent, I stopped for about 5 minutes. I thought of nothing – just a peace came over me. I think it was the first time the “moment of silence” rang true and I really “got it”. You’ve said it all! Thank you for posting this and thank you to all who sacrificed so much for us. Thanks Peter, there are no word to describe how great uncle Eph (Gramp) was. We miss him so much. Thankyou as well Peter. Do you recall great uncle Hay Cooper, Eph”s Brother who also fought in the WW1. I was five or six when he passed on, early sixtys. Do you know if there is a monument standing in Elliott’s Cove of him? His home was near my grandparents William & Ethel Cooper. My sister Darlene and I have such fond memories of him. Hi David. Sorry Uncle Hay was before my time or very close. I was born in 65. 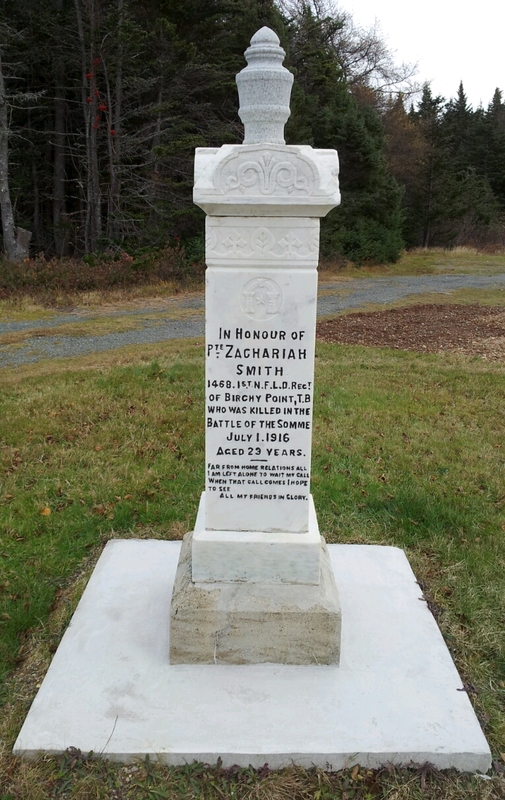 I am not sure where his marker is, I only asked Eric to take those of the Smith’s, so it could very well be in Elliott’s Cove, though its not listed on http://ngb.chebucto.org/Cemetery/cem-eliots-cv-unk-tb.shtml either. He could also be buried in Snook’s Harbour as I think that’s where they all came from originally.